Click here for a large, scrollable version of the map. Please notify me if you notice a change in trail conditions. Last edited by Chase on July 8th, 2012, 9:12 am, edited 1 time in total. Nice, Chase - I love it! Your original map sort of melted on screen (in my browser, at least), so I posted a web version with a link to a larger version. Great information -- looking forward to the trip reports this summer! I have one question about the route, and it's at the very end: it looks like you've followed the Starvation Cutoff trail (steep, unstable switchbacks), so probably couldn't tell from my tiny, original map that I'd intended to have the Hatfield follow the Starvation Ridge Trail all the way back to the trailhead (e.g., across Cabin and Warren Creeks, past the junction with the Defiance Trail, then to the trailhead). My thinking was based on the suitability of the Cutoff Trail for backpackers, but maybe it's just another option to list along the way? awesome map of the Chase-Hatfield Trail, especially the full size version with timestamped annotations. 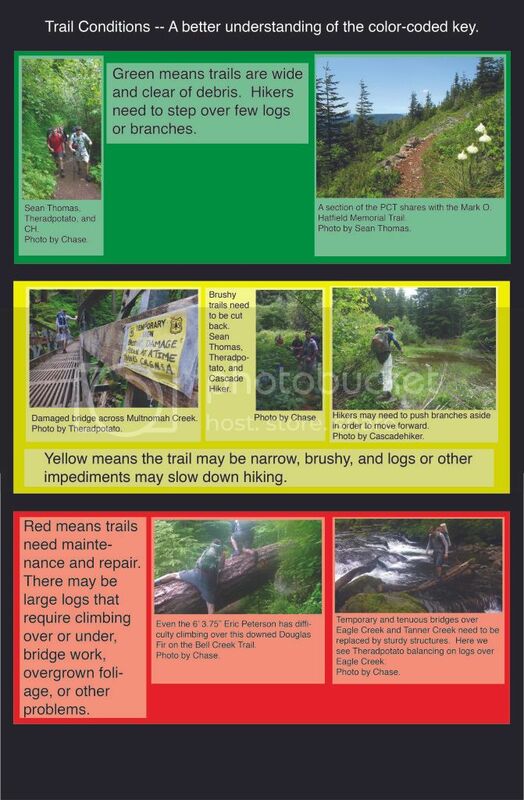 and the trail condition guide with photos is brilliant, including the hilarious 'imbediments'. thanks for all your work ! splintercat - muchos gracious for project conceptualization ! mcds wrote: including the hilarious 'imbediments'. ! I didn't catch that one at all. Thanks! Eric is 6'6" according to my official made-up info. I asked him how tall he was and he said he was taller than me. Therefore, he's 6'6". Splinty, thank you so much for making a larger, clearer version of the map. My computer skills must've had breakfast with Roy's and therefore my version was all blurred-out. You made it look much better. In my opinion, the switchbacks at the bottom of Starvation need to be made a little more backpacker friendly and then I can see no reason why anyone would not want to take them. I can change the map on future versions, though, to reflect your true Hatfield Trail. Thanks for all your input, everyone! Chase, I'll admit an ulterior motive on the longer route -- I'd like to see bridges on Cabin and Warren creeks to make the lower loop a year-round option, so the Hatfield concept might be a way to bring that idea along. I do think the cutoff could be reconstructed to be a bit safer -- it's pretty much a goat path in the lower sections right now. Collapsible lightweight .22 rifle (or just a sidearm) and a flask, problem solved! =P I kid. Anyway, I like the sign concept. How long do you think the painted image would last compared to an engraved/embossed metal sign? I think an embossed metal sign would look a little better on the trail but maybe not be quite as visible. Maybe a painted, embossed metal sign? Then when the paint wears off, there is still the metal to last until it can be replaced. Or somethin =D.